Q. What is the Nova Scotia Certificate of Completion? A. The Certificate of Completion is issued once you have completed the Nova Scotia Online Hunter Education or Crossbow Course. The Certificate is proof you have completed the course and is your admission ticket into the Final Hunter Education Exam where you write your final exam at a local DNR office to obtain your Nova Scotia Hunter Education Certificate. Q. Is the Certificate of Completion the same as a Hunter Education Certificate? A. No. The Certificate of Completion is proof that you have passed the online hunter education course and allows you to take the Final Hunter Education Exam at a DNR office near you, where you will be issued a course completion card once you have successfully completed the final 50-question exam. A. With the online hunter education course, you can do the bulk of the course work from the convenience of your own home. You will only need to meet with a certified instructor to take your final hunter education exam to get your Nova Scotia Wildlife Resources Card. Q. What is the advantage of taking the Online Crossbow Education Course? A. With the online crossbow education course, you can do all of the course work from the convenience of your own home. When complete, your new certification will be automatically updated with the NS DNR. A. The Wildlife Resources Card (WRC) is both a client identification and certification card that is required by all Nova Scotia residents in order to purchase any resident license issued under the Wildlife Act and Regulations. Q. What is the Wildlife Resources Card? A. The Wildlife Resources Card (WRC) is an identification card that required by all Nova Scotia residents in order to purchase any resident license issued under the Wildlife Act and Regulations. The WRC is issued in replacement of the Nova Scotia Firearm Hunting Certificate, Bow Hunting Certificate and the Fur Harvester Certificate. Q. What steps do I need to take to complete the Online Hunter Education Course and obtain my Nova Scotia Hunter Education Certificate? Q. How do I get my Nova Scotia Crossbow Certification? Register online with the NS Department of Natural Resources. A valid Wildlife Resources Card (WRC) is required. Successfully complete the Online Crossbow Course and you're done! Optional – you can update your WRC by contacting the NS DNR and paying a fee of $7.14 + HST. This is not required as your information is automatically updated and the certification will be reflected on your new WRC once your current one expires. Q. When can I take the Online Education Courses? A. 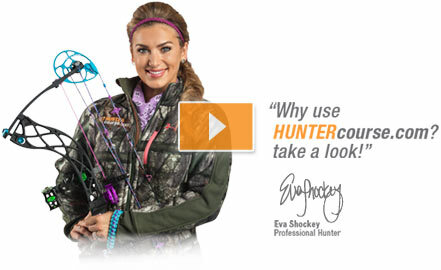 The online hunter and crossbow education courses are available to anyone at any time. We strongly recommend contacting a local DNR office well in advance to make an appointment for the Final Hunter Education Exam. Q. How do I pass the online crossbow education course? A. In order to pass the online crossbow education course , you must pass each chapter quiz with a grade of at least 80%. A. The cost to take the hunter or crossbow course is $29.95 + HST, which is paid during registration for the course. A. Contrary to popular belief, hunting is one of the safest sports around. This is mainly due to the fact that most hunters take gun safety and hunting safety very seriously. Careless or reckless behaviour while hunting can lead to serious injury to one self or to innocent bystanders. This is why Nova Scotia requires all new hunters to take hunter education courses. Q. How to Get a Nova Scotia Wildlife Resources Card? A. Students who have completed a Nova Scotia Hunter Education Course can obtain a Wildlife Resources Card by following the instructions found on their course completion card, which they will receive from the local DNR Office, once they have successfully passed the Hunter Education Exam. Q. Lost Your Certificate of Completion? A. The Certificate of Completion is required to attend the Final Hunter Education Exam at a local DNR office. If you have lost your Certificate you can login to your exam center and print out a new copy. You can also contact HUNTERcourse.com at 1-866-495-4868 or e-mail [email protected] and we will send you a copy of your Certificate of Completion.